A growing number of pet owners are turning to cannabis to treat their ailing animals, and more and more veterinarians are also expressing interest. Bucky, a 16-year-old Queensland heeler, had been athletic until a leg injury, hip dysplasia, and arthritis conspired to limit his mobility. Bucky’s owner, Sand Brim, discussed her concerns with her veterinarian, Gary Richter, MS, DVM, CVA, CVC, who talked about the potential benefits of medical marijuana. Brim is one of a growing number of pet owners who have turned to cannabis to treat their ailing pets. And despite the plant’s federal classification as a Schedule 1 drug, more and more veterinarians are also expressing interest, say advocates. Until the 1930s, inexpensive cannabis-derived tinctures were readily available through physicians and pharmacies in the United States and were used to treat ailments ranging from arthritis to seizures to menstrual cramps. However, cannabis fell out of general use with the passage of the 1937 Marijuana Stamp Act, which added a dollar to every dose, and the plant became illegal in 1970 with the passage of the Controlled Substances Act, which placed marijuana in the same classification as heroin and methamphetamine. Cannabis is widely used today to treat numerous conditions, including amyotrophic lateral sclerosis (Lou Gehrig’s disease), chronic pain, anorexia due to HIV/AIDS, Crohn’s disease, seizures, glaucoma, Tourette’s syndrome, multiple sclerosis, and nausea and vomiting associated with cancer treatment. According to Dr. Marcu, however, there is little consistency among states regarding what conditions cannabis can and cannot be recommended for. In California and Washington, DC, for example, doctors are free to make their own decisions, whereas other states have very specific guidelines. State laws “run the gamut from treating cannabis like regular medicine to treating it like it’s radioactive,” Dr. Marcu says. The Drug Enforcement Agency (DEA) and Food and Drug Administration make it very difficult for researchers in the United States to study marijuana’s potential medicinal qualities effectively, Dr. Marcu notes. However, there is hope for change through the Compassionate Access, Research Expansion, and Respect States (CARES) Act, which has bipartisan support in both the House and Senate. As of this writing, the legislation was still in committee. In addition, Americans for Safe Access is suing the DEA to update the information on its website, some of which is 40 years old, Dr. Marcu says. Eight states and the District of Columbia currently permit the adult recreational use of marijuana, and 28 states have approved the medicinal use of marijuana for humans. The patchwork of laws, however, hasn’t stopped veterinarians with an interest in alternative medicine from discussing the benefits of cannabis to relieve anxiety, pain, seizures, gastrointestinal problems, and other ailments in dogs and cats, as well as other species. As a result of this surging interest, marijuana entrepreneurs—many of them veterinarians—have developed a variety of medicinal cannabis products specifically for animals. Sarah Brandon, DVM, witnessed the medicinal properties of marijuana 20 years ago when her husband, Greg Copas, also a veterinarian, started smoking it to ease injury-related joint pain. Based on his success, they began giving marijuana to their Rottweiler, Reilly, to ease the pain of his hip dysplasia, with similarly positive results. More research followed, and in 2014 Drs. Brandon and Copas co-founded Canna Companion, a company based in Washington State that manufactures 2 whole-plant hemp products for dogs and cats. Anecdotal evidence like this abounds, yet most veterinarians remain reluctant to recommend cannabis to their clients for several reasons. Foremost is the fact that marijuana and hemp are still considered controlled substances by the DEA, which means it is illegal for veterinarians to prescribe them for pets. 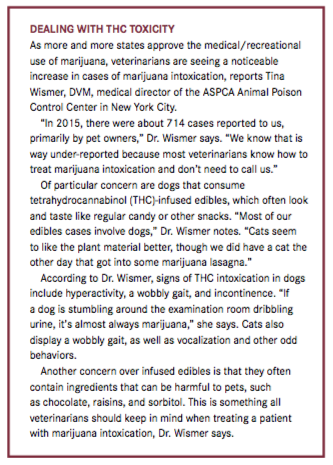 “We can, however, discuss the benefits of medical cannabis with pet owners and provide them guidance regarding what the best products would be for their pet and what a successful dosing regimen would look like,” notes Dr. Richter, who had such a discussion with Sand Brim. 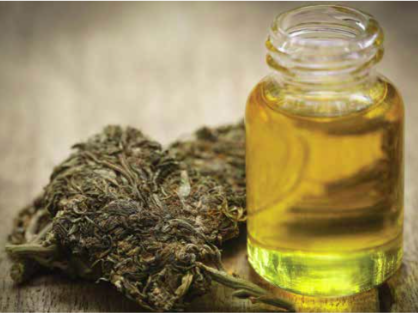 The American Veterinary Medical Association (AVMA) has no formal position regarding the veterinary use of medical marijuana but does agree that more studies are needed, says Sharon Granskog, the AVMA director of media relations. Its human equivalent, the American Medical Association, holds a similar position and has urged the National Institutes of Health to implement administrative procedures to facilitate grant applications and the conduct of clinical research into the medical utility of marijuana. It has also urged that cannabis be reclassified on the federal level. Don Vaughan is a freelance writer based in Raleigh, North Carolina. His work has appeared in Military Officer, Boys’ Life, Writer’s Digest, MAD, and other publications.